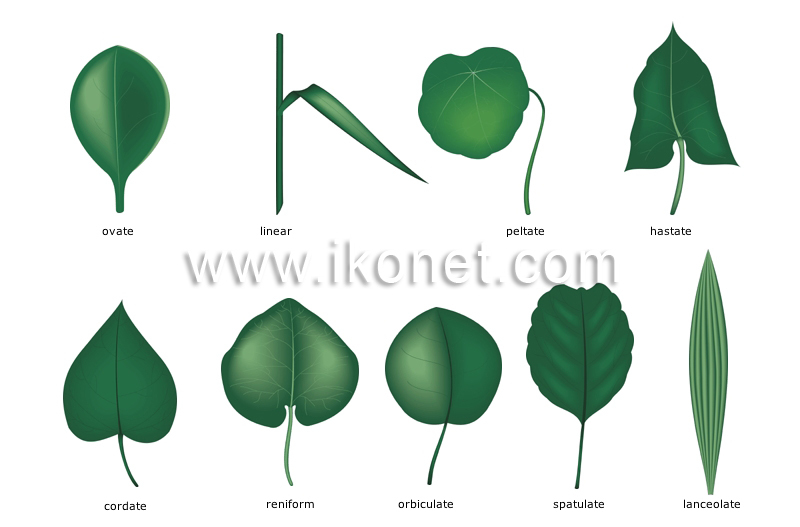 Leaves with an undivided blade; there are many types, grouped according to shape. Simple leaf with a narrow blade that is longer than it is wide, ending in a point. Simple leaf with an egg-shaped blade. Simple leaf with a petiole attached perpendicularly to the center of the blade’s underside. Simple leaf with a long and very narrow blade and almost parallel margins. Simple leaf with a kidney-shaped blade. Simple leaf with a somewhat rounded blade. Simple leaf with a heart-shaped blade. Simple leaf with a spear-shaped blade. Simple leaf in which the blade widens, taking the shape of a spatula.